5,274 undergraduate students and 1,628 graduate students. Students come to UNK from 91 of the 93 Nebraska counties, all 50 states including the District of Columbia, and over 50 foreign countries. 322 full-time and 117 part-time faculty. 99% of full-time faculty teach undergraduate courses, generating 88% of the credit hours at UNK. More than 76% of full-time faculty have the highest degrees in their fields. Student/faculty ratio: 18.9 to 1. UNK offers 120 undergraduate majors, 22 pre-professional programs, and 27 graduate programs. Each year, the UNK Honors Program accepts more than 120 freshmen based on a minimum top 25% class rank, a minimum 27 ACT score, letters of reference, extracurricular accomplishments, and essays. At present, there are 550 students in the Honors Program. UNK’s undergraduate research program is a national model. Campus programs support students working one-on-one with professors to conduct original research and creative projects. Over 30% of UNK students do research outside of class and present their projects at academic conferences. UNK is the only campus in Nebraska to participate in the National Student Exchange that allows students to attend one of 175 other universities or colleges across the continent for a semester or a year, often at UNK tuition rates. Many UNK programs have a job placement rate that's almost 100%, including Accounting, Athletic Training, Education (particularly those with endorsements in Biology, Chemistry, Language Arts, Math, Music, Physics, and Special Education), Computer Science and Information Technology, Graphic Arts, Industrial Technology, School Psychology, and Speech-Language Pathology. 20% of all certified staff in schools and ESUs across the state of Nebraska have at least one degree from UNK. Almost 43% of all school Superintendents and approximately 30% of all Principals in the state of Nebraska are UNK graduates. Approximately 36% of all School Psychologists and 54% of all ESU School Psychologists in the state of Nebraska are UNK graduates. 21% of all School Counselors in Nebraska are UNK alumni. Approximately 33% of all Speech-Language Pathologists in Nebraska are UNK graduates. Many UNK graduates become administrative leaders in both the public and private sectors of the state and the nation. Others go on to successfully apply to medical, law, and other professional and graduate schools across the country. Member of NCAA Division II—Mid-America Intercollegiate Athletic Association. Programs include baseball, softball, football, volleyball, wrestling, women’s swimming and diving, women's soccer, men’s and women’s cross country, men’s and women’s basketball, men’s and women’s tennis, men’s and women’s golf, and men’s and women’s track and field. Colors: Royal Blue & Old Gold. UNK athletes are students first. The average cumulative GPA for all 19 Loper teams is consistently above 3.0. Seven traditional-style residence halls, one suite-style residence halls, two Greek chapter house complexes, and one university apartment complex. All residential units are within easy walking distance of the academic buildings, the library, the student union, and the Health and Sports Center. Campus is comprised of 515 acres, including the soon-to-be-developed University Village. UNK has more than 48 buildings including classrooms, labs, residence halls, and athletic venues. The proximity of the campus offers easy access to the city's vibrant and growing community including: cultural events, shopping centers, outdoor recreational facilities, affordable housing, award-winning restaurants, as well as hockey, musical shows, plays, and a variety of concerts, many within walking distance of the campus. Over the last decade, UNK has invested more than $100 million renovating or expanding every academic building and residence hall, the College of Education Building, the Nebraskan Student Union, Foster Field, the Antelope/Nester complex of residence halls, which provide apartment style living and many new amenities for students. In addition, a major renovation and addition to Bruner Hall of Science, including an all-new Planetarium, was completed in the Fall 2009. A new Wellness Center addition to the Health and Sports Center/Cushing Coliseum opened in fall 2014. The new Health Sciences Complex, which will house an expanded UNMC College of Nursing Kearney division and a new UNK-based UNMC School of Allied Health Professions, opens in fall 2015. The UNK campus is also a Nebraska Statewide Arboretum site. During the 1950s, The Kearney Hub began using a shortened version of antelopes (Lopers) to refer to the school’s athletic teams. The student paper quickly picked up “the Lopers” and the name stuck. 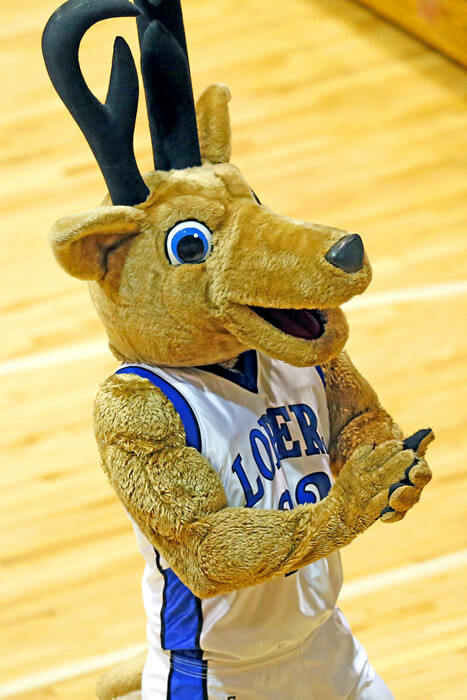 Loper legend is that the mascot is a North American Antelope, yet, fact is, there are no antelopes in North America. The pronghorn, which looks much like an antelope and is commonly called an antelope, is most likely what the students in 1910 were referring to. There are 91 species of antelope indigenous to regions in Africa and Eurasia. Pronghorns were brought to scientific notice by the Lewis and Clark Expedition in South Dakota and their range extends from Canada through Minnesota and Texas to California, to northern Mexico. Louie the Loper emerged in the early days of UNK, and he wears a blue football jersey and blue shorts in the summer and fall, and white basketball jersey and white shorts in the winter and spring.